My favorite food from the dining courts. 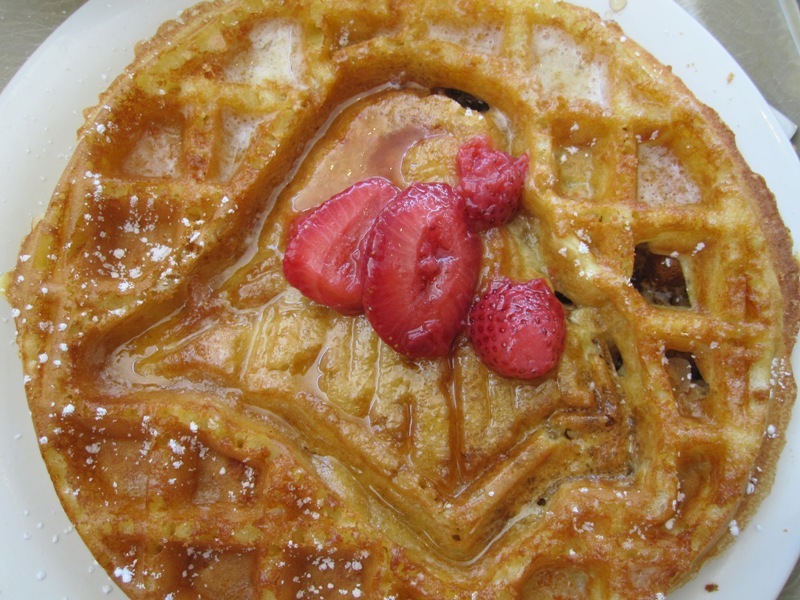 I would be perfectly okay with someone finding me a Purdue waffle (Boiler)maker. For nearly nine years, I’ve lived on my own. I’ve had various roommates in houses and apartments, and I’ve lived in the university residence halls, eating dining hall meals, microwavable dinners or fast food. However, for a year and a half, I lived with only my dog, Evie. (She eats most anything.) I found the food situation to be vastly different when I lived alone than when I lived with roommates. During this year and a half, I lived in the country, and greatly enjoyed it. I worked in the city but didn’t want to have to stop at the grocery store every day because of bad planning. When I lived on the farm, we only went to the grocery store once or twice a month for all five of us. I liked that approach. When I had roommates, I could always find someone to eat the leftover food that I didn’t eat. However, I couldn’t feed my dog everything I couldn’t eat, and leftovers went bad before I could eat them. I often had to toss food out. That meant a lot of my funds went down the drain, as well. Finally, health challenges (some genetic, some environmental) meant I needed to eat well. I had to consume the right foods and at the right times. All of these factors meant I needed to shop well. I needed to look at quality, economy and my ability to eat everything I had without wasting it. So I figured out some tips and tricks for good grocery shopping. One thing eating good food now can do is help prevent illness and high health care costs. For example, whenever I felt run down in college, my mother would ask, “When was the last time you ate your green beans?” The answer I’d come up with was usually, “About a week ago.” So I’d go out and get some green beans, warm up a can and feel better almost instantly. Before I share some tips, here is my first disclaimer: often nowadays, single does not refer to someone who is in a relationship. For the purposes of this post, single simply means someone who is not married (around 50% of the country). These tips specifically have people who live alone in mind (and that’s around 27% of the country, as of 2013), but can apply to anyone with roommates, especially if you’re not sharing food. The second disclaimer: I cannot stand Ramen noodles. They are not worth paying only $.20 for a packet. Tip #1: Buy a big crockpot. Crockpots may not be found at the grocery store, but they are essential to food shopping and meal preparation success. Crockpots can make many meals with little effort. For most recipes, all that is needed is 10-20 minutes for preparation. When the food, especially meat, cooks slowly all day, it tastes delicious. I found my crockpot for $30 at Big Lot, and it has been worth so much more. It was the best cooking investment I’ve made. I greatly enjoy coming home to the aroma of good food, especially on Sundays after church. I would put the ingredients in before leaving for Bible study, then return home for a good meal and a relaxing afternoon. Recipes are easy to find at sites like AllRecipes, Cooking Light, Food.com and Betty Crocker. There is also All Free Slow Cooker Recipes, which sends out a free email newsletter dedicated to slow cooker food. I have found some recipes for one or two people, but I’ve often found these to be impractical because they would require separating frozen food into multiple pieces and saving the extra back. For me, it was easier to put everything in as if I was making the meal for multiple people, and then have the leftovers for lunch, which would often last me for two weeks, as long as I kept it in an airtight container. I did not eat the meal every day so I didn’t tire of it, as I would alternate between the warm meal and sandwiches. Tip #2: Focus on quality and what you like. Life is too short to eat food we don’t like. In the U.S., we are fortunate with the ability to choose from many varieties of food and are able to eat what we like. The food also will be as high a quality as we are willing to pay for. Thinking back to my financial philosophy, higher quality food leads to higher quality health and life. The USDA also puts out a “Cost of Food” report each month. For December 2014, monthly costs were $167.10-$333.50 for my age range. It depends on how a person likes to shop and his or her eating habits. In my case, I have recently developed a sensitivity to peanuts, which is frustrating because I am a huge fan of peanut butter cookies. Because of this, I substitute with almond or cashew butter for those times when I crave a good peanut butter and jelly sandwich. Almond and cashew butter cost $6.95-$7.67 for a 12-oz jar. (By comparison, peanut butter seems to be anywhere from $1.50 to $4.99 for that size.) However, every so often, I just want those kinds of sandwiches, and they fill me up. Also, even though it’s a small jar, it lasts me a while because my meals vary each day. It has been a good investment to purchase the more expensive almond and cashew butter. I also am a big fan of high quality bread. I would often buy the Brownberry brand bread because I like its taste, thickness and texture. Flavors from honey whole wheat to 12-grain to double protein are available. One loaf of Brownberry costs $3.99 to $4.19 compared to $1.50 to $2.99 of store brand or Aunt Millie’s bread. However, I went through one loaf of bread more slowly when I purchased Brownberry and therefore spread the cost out over more days. That is, I would buy one loaf every two or three weeks as opposed to one loaf every week or two. Making an almond butter and jelly sandwich with Brownberry or similar bread was delicious and nutritious, and I felt good after eating one of those sandwiches. The quality and the fact that I liked both products so well made the higher cost well worth it. Tip #3. Buy perishable foods in small amounts. 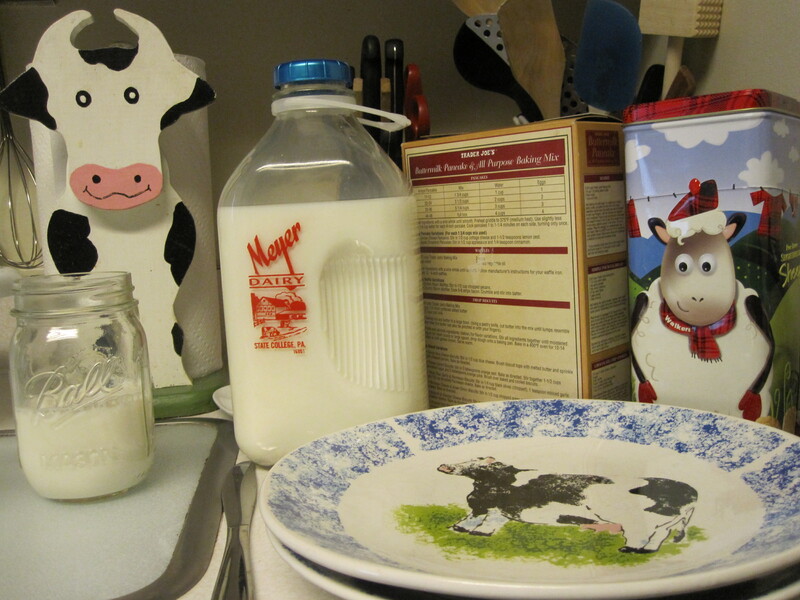 I miss milk in glass jars from the Meyer Dairy in State College, Penn. When I first would take off the cap, the milk would go “Glub glub” into the Mason jar. There seems to be a mentality here that buying in bulk is always the way to go because it’s cheaper. But sometimes, for a single person, the last of that bulk purchase goes bad before I even get to it. For example, there are certain times of the year, like summer or allergy season where I don’t drink a lot of milk. Therefore, I need to downsize from gallons of milk to half gallons because I just don’t drink it fast enough. When buying perishable foods, think about how much time it will take to consume that product, as well as the number of times you are willing to go to the store. I’ll need to go to the County Market more often if I buy half gallons and I’m drinking a lot of milk. The choice becomes to make a greater number of grocery store trips or buy a whole gallon and make sure I can drink it before it goes bad. Tip #4. Be bold. Think variety. Try some new foods by buying small jars and testing out new recipes. This also adds variety to meals. For example, I would buy small jars of several different kinds of jelly rather than one large jar. These small jars last me two months, and I was able to try different flavors. Put enough variety in your meals and there will be no worries about whether or not the jars, boxes or bags will go bad before being able to finish off their contents. For my recent job, I needed to make sure I was well nourished with plenty of energy available for the intensity required there. Not fueling up on fruits and vegetables, meat and milk, and good bread meant I would probably fumble my way through the day. Variety was essential. Tip #5. Resist the sales. Stocking up when nonperishable items are on sale can be helpful, but resist with perishable foods, especially if buying on impulse. I am extremely guilty of this, especially with cheese blocks. I like to buy many varieties for sandwiches, mac and cheese, calzones, etc. However, I have found that time to make these dishes is often lacking. The cheese grows mold quickly, and while it’s possible to cut off the side with the mold and use the rest of the block, I would rather use the cheese without it going bad. Another mistake was buying Hershey’s chocolate, Graham crackers and marshmallows all together. There was a sale on these products as long as they were purchased together for making s’mores. I thought, I’ll host a bonfire! Well, I never hosted that bonfire, I’m not supposed to eat chocolate (and I don’t always like it all that much) and I ended up eating the graham crackers for snacks. Guess I need some cereal for a ton of Rice Krispy treats…. 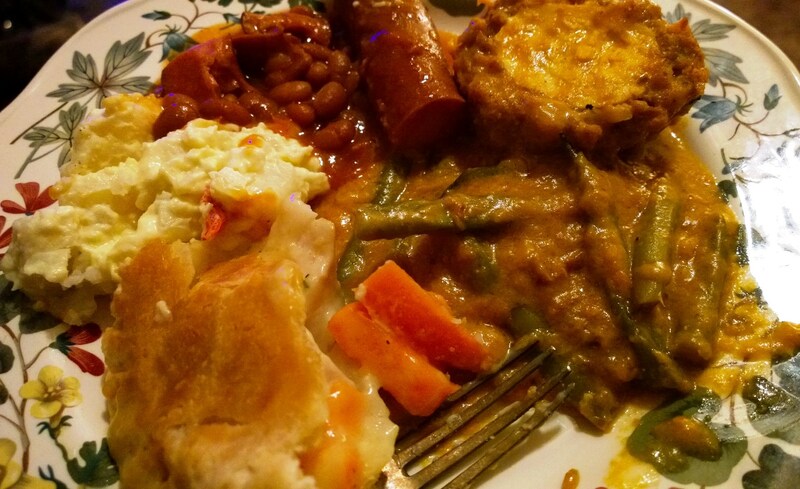 My grandmother made this meal for me shortly after Christmas. It was so beautiful I was moved to take a picture. I was sitting next to the fire and was so warm and toasty…. This tip won’t apply to every food. For example, Campbell’s Chicken Noodle Soup just can’t be beat when I’m not feeling well and all I want to do is dump food into a pan and warm it up. However, I have found that it is more cost effective (and tastier) to make my own stew in the crockpot rather than buying several cans of Campbell’s stew or Dinty Moore’s. I like the broth better, as well; it’s as weak or as strong as I make it. This stew can be frozen for future use, as well. My recipe is simple: beef or lamb, enough beef broth to cover the meat, sliced potatoes, carrots, a few onions for flavor, some thyme or Lawry’s salt, cook on low for eight hours and voila! Add a tablespoon of flour at the very end to thicken up the broth. Chicken and chicken broth can be substituted for the meat and beef broth. Another helpful hint is to use cream of chicken to make some soup. Anything can be added. Recently, I made a delicious creamy soup by boiling potatoes and a beef roast (chicken or lamb could be used as well), then adding these to a pan of a can of cream of chicken after cutting up the beef. I warmed everything up on the stove and stirred everything together. It was warm and creamy and easy on the stomach. It only took around 20 minutes to make, too. Tip #7. Always keep the essentials around. Make sure that, if certain meals are cooked often at your place, the key ingredients for those things are always around, especially if they’re nonperishable or can be frozen. I am very bad about deciding what I want to eat on a certain day, and sometimes, I can start on a recipe and not realize I’m missing a key ingredient. With these ingredients around, I can always whip up something, and have often experimented for some interesting new meals and tastes. So there you have it. Seven tips for making grocery shopping and cooking for single people healthy and simple and cost-effective. Let me know some of your advice for effective grocery store shopping, whether single or married, in the comments below. I’ve also published this post on Medium. If you like it, stop by and click recommend! Elise does a great job in her blog post about shopping and cooking for one. In our household of two, we cook regular size meals and have leftovers for lunch. I often freeze leftovers too and enjoy the flexibility to pull them out when no one feels like cooking or time is short. The Hubs and I also started planning our meals the week before. We grocery shop for just those items, and it decreases the chance that food will spoil as we know we will use it within the next week. Excellent tips, Elise! I can even appreciate these as a vegetarian. Another essential that’s on my list is quinoa (I use that over regular white rice typically). It’s easy to cook and can be stored for a long period of time. Quinoa and kale are my go-to super foods! Thanks, Liz! And thanks for sharing this on Twitter, too. I’ve tried quinoa once, didn’t think it was too bad. Unfortunately, I’ve gotten into a pattern of not cooking as much as I used to, so I don’t have all my staples, and the cereal is not around, so a trip to fix this is needed!